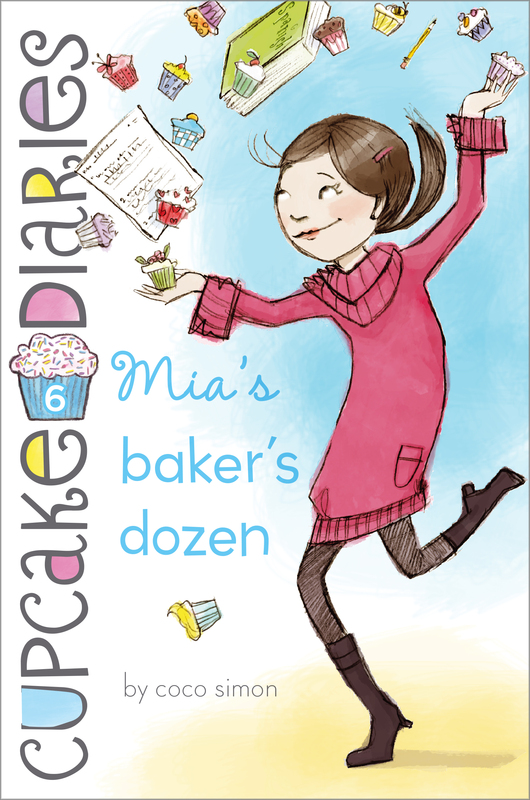 Mia finds that one more in the mix is always better in this treat of a tween series! Mia is getting used to her new family now that her mom is remarried to Eddie and she’s gained a new stepbrother, Dan. She’s in the groove of going to her dad’s house on the weekends, and everything is going pretty well at home and at school. Well, except for Spanish class. Mia’s parents and stepfather speak it and she does too—but speaking it and writing it are two different things, and somehow Mia ends up in the hands of the merciless Mrs. Alvarez and almost failing Spanish class. Still, things are so good at home that Mia doesn’t want to worry anyone or rock the boat. But when her parents find out—all three of them—she realizes that instead of having two parents, she’s lucky enough to have three, and all three of them pitch in to help her. A baker’s dozen is a bonus! I’ll Definitely Finish It Tomorrow . . .
Me llamo Mia, y me gusta hornear pastelitos. That means “My name is Mia, and I like to bake cupcakes” in Spanish. A few months ago, I could never have read that sentence or even written it. Maybe that doesn’t sound like a big deal. But for me, it totally was. Here’s the thing: I’m good at a bunch of things, like playing soccer and drawing and decorating cupcakes. Nobody ever expected me to be good at them. I just was. But everyone expected me to be good at Spanish. My whole family is Latino, and my mom and dad both speak Spanish. I’ve been hearing it since I was a baby, and I can understand a lot of it and speak it pretty well—enough to get my point across. But reading and writing Spanish? That’s a whole other thing. And the fact that I was bad at it got me into a big mess. Well, maybe I got myself into a big mess. But Spanish definitely didn’t help. The whole situation kind of blew up this winter. You see, when I started middle school in the fall, they placed me in Advanced Spanish with Señora Delgado because my parents told the school that I was a Spanish speaker. At first I did okay, but after a few weeks it was pretty clear to me that I was in over my head. I could speak it but not write it. The homework kept getting harder and harder, and my test grades were slipping. One night in February, I was trying really hard to do my Spanish homework. Señora asked us to write an essay about something we planned to do this month. I decided to write about going to see my dad, who lives in Manhattan. I visit him every other weekend, and we always go out to eat sushi. It sounds simple, but I was having a hard time writing it. I always get mixed up with the verbs, and that was the whole point of the essay—to use future indicative verbs. (Yeah, I’m not sure what those are either.) Anyway, I was trying to write “We will eat sushi,” and I couldn’t get the verb right. “Comemos? Or is it comeramos?” I wondered aloud with a frown while tapping my pencil on my desk. My head was starting to really hurt, and it wasn’t just because of the homework. “Dan, TURN IT DOWN!” I yelled at the wall in front of me. On the other side of the wall, Dan, my stepbrother, was blasting music like he always does. He listens to metal or something, and it sounds like a werewolf screaming in a thunderstorm. He couldn’t hear me, so I started banging on the walls. “Thanks,” I muttered, even though I knew he couldn’t hear me. I looked back down at my paper, which was only half finished. Where was I again? Oh, right. Sushi. At least that word is the same in any language. My brain couldn’t take any more. I picked up my smartphone and messaged three of my friends at once. Anyone NOT want to do homework right now? I asked. Alexis replied first. She’s the fastest texter in the Cupcake Club. Of course, I should have known. Alexis is one of those people who actually likes doing homework. It’s better than babysitting my little brother! came the next reply. That’s my friend Emma. I actually think her little brother, Jake, is kind of cute, but I also know that he can be annoying. The last reply came from my friend Katie. Let’s go on a homework strike! I laughed. Katie is really funny, and she also feels the same way I do about a lot of things (like homework). That’s probably why she’s my best friend here in Maple Grove. Where are we meeting tomorrow? I asked. I think I mentioned the Cupcake Club already. That’s a business I started with Alexis, Emma, and Katie. We bake cupcakes for parties and other events, and we meet at least once a week. We can do it at my house, Emma replied. Works for me! Alexis texted back at light speed. Alexis always likes going to Emma’s house, and it’s not just because she and Emma are best friends. She used to have a crush on Emma’s brother Matt. He’s pretty cute, but Emma’s brother Sam is even cuter. Everyone come with ideas for the Valentine’s cupcakes. Ugh! I hate that holiday! Emma complained. But there’s candy! Katie wrote. And everything’s pink, I reminded Emma since pink is her favorite color. K, you have a point. But still. We have to watch all the couples in school make a big deal out of it, Emma replied. And watch all the boys go gaga for Sydney, Alexis chimed in. Sydney is the president of the Popular Girls Club, and Alexis is right—lots of boys like her. Any boys who like Sydney have cupcakes for brains, Katie wrote. Got to go! Twelve more math problems left! Emma wrote. I have 2 go study, Alexis added. I thought you were done? Katie wrote. This is just for fun , Alexis wrote back. If u want to have fun u can do my homework, Katie typed. LOL! CU tom, Alexis typed. I said good night to my friends and put down my phone. I stared at my paper for a few seconds and then I picked up my sketchbook. My Spanish class isn’t until after lunch, so I figured I could finish the essay then. I couldn’t concentrate now anyway. Besides, I was dying to finish a sketch I had started earlier. My mom’s a fashion stylist, and she’s always taking the train to New York to meet with designers and boutique owners. I guess I take after her because I am totally obsessed with fashion and I love designing my own clothes. Once in a while, Mom takes me to meetings with her and I get to see all the latest fashions before other people do. Lately I’ve been trying to design a winter coat that keeps you warm but isn’t all puffy. I hate puffy coats. I thought maybe the coat could be lined with a fabric that kept you warm and looked streamlined. Maybe cashmere? But that would be really expensive. Flannel might work; and it would be so cozy, like being wrapped up in your bed’s flannel sheets! I opened up my sketchbook, a new one that my dad gave me. It’s got this soft leather cover and really good paper inside that makes my drawings look even better. I picked up a purple pencil and started to finish my sketch of a knee-length wraparound style coat. There was a knock on my door, and then Mom stepped in. “Thanks!” I replied, and she kissed me on the head and left the room. I started to feel a little guilty about lying about my homework, but I pushed the feeling aside. I was definitely going to finish it tomorrow, so no problem, right? Actually, it was a problem . . . a big one.